Philly wants to copy Seattle’s law to make hourly workers’ schedules easier. Here’s how it’s working there. 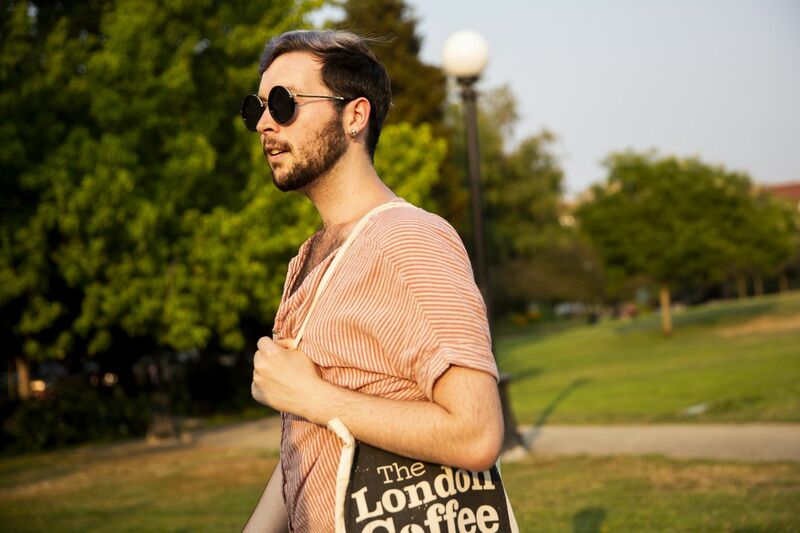 Levi Underwood, a shift supervisor at a downtown Starbucks in Seattle, walks through Cal Anderson Park on his way to a thrift shop. Underwood, who is taking online classes at ASU, a benefit for Starbucks employees, says his work-school balance has improved since Seattle’s secure scheduling law took effect in July 2017. In the coming weeks, Philadelphia City Council will begin debating a bill designed to deal with a common headache for an estimated 20 percent of the city's labor force: their often unpredictable work schedules. Councilwoman Helen Gym introduced the legislation in June. If passed, backers say, 130,000 employees — most of them part-time chain retail and fast-food workers — would get their schedules two weeks in advance, be compensated for last-minute changes, and have a chance at full-time hours. Seattle is the leader in worker protection laws. What can Philly learn as it considers a ‘fair workweek’? "Too many people are kept in poverty because of terrible practices like abusive scheduling that wreak havoc on people's lives and leave them unable to predict their monthly incomes for rent or child care," said Gym. Other big cities have similar "fair-workweek" legislation, which gives Gym confidence that Philadelphia can, too. It also means there's a well of insight into what workers and their bosses might expect if she's right. To see how this kind of law is working elsewhere, the Inquirer and Daily News, along with WHYY, traveled to Seattle, one of four major cities with a fair-workweek measure. In July 2017 — three years after becoming the first major city to pass a $15-an-hour minimum wage — Seattle rolled out its "secure scheduling" ordinance. The law applies to roughly 1,000 employers and an estimated 40,000 employees, including single mothers, but also college students struggling to juggle class and work. Levi Underwood, a shift supervisor at Starbucks, always got his schedule two weeks in advance, even before secure scheduling, but his manager often asked him to cover extra shifts on short notice. One time, the communications major failed one of his classes because he had to fill in on a Saturday he'd set aside to finish a final paper. "I got called and it was just like, 'There's no one else. You're the only one that can come in,'" said Underwood, who was already scheduled to work that Sunday. He ended up rushing the paper, which meant he didn't get enough points to pass the course. Failing the class meant he had to take it again, delaying his timeline for finishing his degree. Thanks to the new law, Underwood said, he doesn't feel obligated to pick up last-minute shifts. Similar to the bill proposed in Philadelphia, Seattle's law has protections against retaliation. Legally, workers can refuse unscheduled hours without worrying that they are risking their jobs. Hawa Hamadi serves up an order at Ivar’s Fish Bar on the Seattle waterfront pier. Ivar’s is one of the local businesses affected by Seattle’s secure scheduling law, which took effect in July 2017, aiming to establish more predictable work schedules for employees of retail and food chains. There are also financial consequences if a manager changes the schedule after workers get their hours. For example, if a manager takes someone off the schedule, that worker gets paid for half of the missed hours. It's called premium pay, and it's a sticking point for some businesses affected by secure scheduling, but also for some employees, who say those bonus hours often take time to reach their paychecks. Bob Donegan is president of Ivar's, an iconic Seattle seafood chain that employs roughly 1,000 people. About a quarter of them are covered by secure scheduling. Donegan said that has hurt his bottom line. During the first six months the law was in effect, Ivar's paid almost $30,000 to employees because of schedule changes, some of which Donegan said couldn't be avoided. "We don't get the time of kickoff for the University of Washington Huskies football games on Saturday until Tuesday night, so every employee who works in the stadium gets a 50 percent pay premium," said Donegan. Bob Donegan, president of Ivar’s, outside his location on the waterfront in Seattle. The law has cost his business thousands of dollars in software costs and “premium pay” for unexpected schedule changes due to sports events and weather. The company also laid out $7,000 for software to document scheduling changes at all of its quick-serve locations, including the Fish Bar on Pier 54, a popular tourist destination. "That would be the profits that we earn in the Fish Bar in a busy summer month," Donegan said. It's one of the reasons Ivar's has raised menu prices, he said. Seattle hired a team of researchers to evaluate the law over the next two years. In the meantime, there are data about how many companies have broken the law — and paid for it — because of Seattle's dedication to enforcement, a standout among cities with similar measures. To date, investigators with Seattle's Office of Labor Standards have closed five cases tied to secure scheduling, including one with Gap for $20,186.24. Policy manager Karina Bull said the goal to finish cases in six months is among the fastest in the country. It appears that Philadelphia could be the next city with a fair-workweek law; City Council has scheduled a hearing about it on Oct. 30. Eight council members, including Gym, cosponsored the bill. If the measure passes out of committee, she would need just one more vote to send it to Mayor Kenney's desk for a signature. "From working parents to conscientious employers to workforce development and labor advocates to public interest groups and religious leaders — people understand that stable schedules make sense for workers and for businesses," said Gym.